A sit-stand desk, as the name implies, can be raised or lowered so that employees can have the option of either standing or sitting while they’re working. 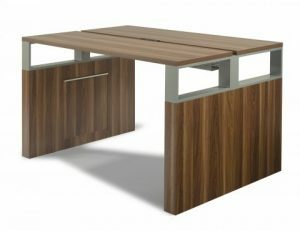 These desks are becoming increasingly popular because of the health benefits that they can provide to employees. Being able to stand for part of the day can prevent back and neck pain, and has even been linked to a reduction of certain health risks such as heart disease and diabetes. It’s also important that employees are able to sit sometimes to give their feet a rest, making a sit-stand desk an ideal option to give employees the best of both worlds. Plus, once you decide to purchase your new sit-stand desks from us, we will deliver and assemble them for you at no additional charge. This allows your employees to start enjoying them as soon as possible. For more information about the sit-stand desk brands and styles we have available for businesses in Roswell, GA and the surrounding areas or other furniture we offer like benching systems, contact the furniture experts at NorthPoint Office Furniture today.